In this post, we’ll discuss what constitutes a big innodb_log_file_size, and how it can affect performance. In the comments for our post on Percona Server 5.7 performance improvements, someone asked why we use innodb_log_file_size=10G with an indication that it might be too big? In my previous post (https://www.percona.com/blog/2016/05/17/mysql-5-7-read-write-benchmarks/), the example used innodb_log_file_size=15G. Is that too big? Let’s take a more detailed look at this. Since that time many improvements have been made both in Percona Server and MySQL, but a small innodb_log_file_size still affects the throughput. How close is innodb_max_dirty_pages_pct to the percentage of actual dirty pages. You can see this in the LRU flushing metrics. What amount of free pages are defined by innodb_lru_scan_depth. This is also in LRU flushing metrics. So in this equation innodb_log_file_size defines the async point, and how big checkpoint age can be. Before jumping to graphs, let me remind you that the max checkpoint age is defined not only by innodb_log_file_size, but also innodb_log_files_in_group (which is usually “2” by default). So innodb_log_file_size=2GB will have 4GB of log space, from which MySQL will use about 3.24GB (MySQL makes extra reservations to avoid a situation when we fully run out of log space).
. . . and also a related graph of how many pages are flushed by different forces (LRU flushing and adaptive flushing). You can receive this data by enabling innodb_monitor_enable = '%'. From these charts, we can see that with 2GB innodb_log_file_size InnoDB is forced by adaptive flushing to flush (write) more pages, because the current checkpoint age (uncheckpointed bytes) is very close to Max Checkpoint Age. To see the checkpoint age in MySQL, you can use the innodb_metrics table and metrics recovery_log_lsn_checkpoint_age and recovery_log_max_modified_age_sync. 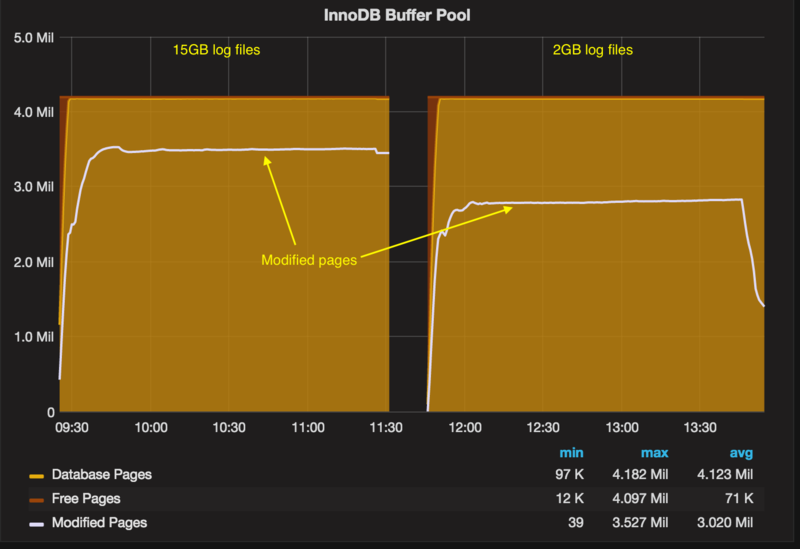 In the case using innodb_log_file_size=15GB, the main flushing is done via LRU flushing (to keep 5000 pages ( innodb_lru_scan_depth) free per buffer pool instance). From the first graph we can figure that uncheckpointed bytes never reach 12GB, so in this case using innodb_log_file_size=15GB is overkill. 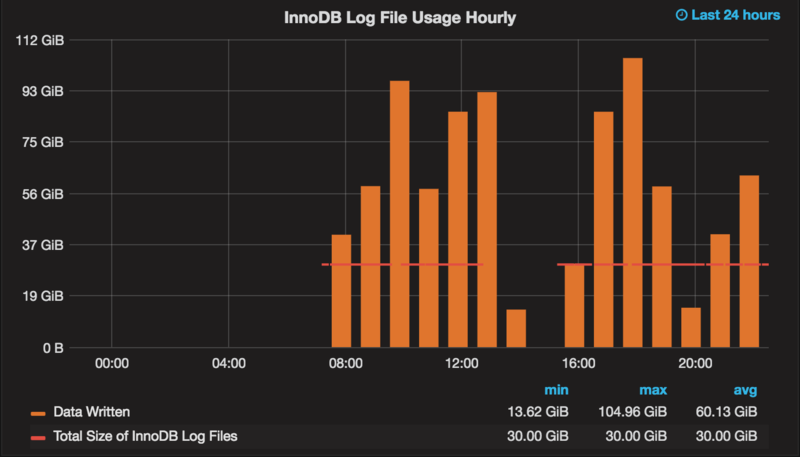 We might be fine with innodb_log_file_size=8GB – but we wouldn’t know unless we set the innodb_log_file_size big enough. MySQL 5.7 comes with a very convenient improvement: now it is much easier to change the innodb_log_file_size, but it still requires a server restart. I wish we could change it online, like we can for innodb_buffer_pool_size (I do not see technical barriers for this). With innodb_log_file_size=2GB, the throughput is about 20% worse. With a 2GB log size, you can see that often zero transactions are processed within one second – this is bad, and says that the flushing algorithm still needs improvements in cases when the checkpoint age is close to or at the async point. This should make a convincing case that using big innodb_log_file_size is beneficial. In this particular case, probably 8GB (with innodb_log_files_in_group=2) would be enough. I would still like to see improvements in this area. Crash recovery is the biggest showstopper for using a big innodb_log_file_size, and I think it is possible to add parallelism similar to multithreaded slaves into the crash recovery process. In my experience, I have rarely encountered a setting for log_file_size of 2GB or more. Only one case (out of several dozen) did that formula recommend more than 2GB. I had exactly the same question Rick, and found the “somewhere” source: It was Baron Schwartz’s blogpost back in 2008, https://www.percona.com/blog/2008/11/21/how-to-calculate-a-good-innodb-log-file-size/. Vadim, given current InnoDB optimizations, is this still a valid point in calculating a good InnoDB logfile size? I think 60 minutes recommendation is arbitrary and simply just wrong. To show the example, this chart show log writes per hour. You can see in some hours there is over 90GB writes into logs – but that absolutely does not mean we need to have 90GB of log space. There is barely 9Gb there. So the most likely current total 30GB log size is overkill and just 12-15GB would be enough. We mostly use our MySQL database servers for shared hosting of many, small, databases (for customer websites that require a MySQL database, like WordPress, Joomla and Drupal. They often don’t exceed a few hundred MB’s in size, some are “large”, between 900 MB and 2 GB. Doing the log file size calculation, an innodb_log_file_size = 256M would be more than enough to store an hour worth of data. Is there any reason – performance wise – to set this higher, to 1, 2 or even more GB’s? So that’s what I tried to explain with this post. To understand if you need to increase innodb_log_file_size – you need to see if Checkpoint Age is close to Async point. or better way to look at graphs like in this post – as it gives your historic information. If Checkpoint Age is getting close to Async point – I would consider to increase innodb_log_file_size, say by 20%. Then repeat again, but make sure you are happy with your crash recovery time. While applying your above code, we are getting something like: 0.00543022 (the number is always 0.00n every time we ran the above code). When examining the formula, I see that you are subtracting the “Log Sequence Number” from the “Last Checkpoint”, and getting the difference in megabytes. My question is, why are you using the “Log Sequence Number” in your formula and not the “Pages Flushed Up to”, which seems to be the async point as it is taking place before “Log Sequence Number”? Also, why is the “Log Sequence Number” always identical to “Log Flushed Up To” (both seem to be the sync point). Finally, what is an ideal value returned by the above formula? What is too close and what is too far? Is a few megs of difference comfortable? The thing with such recommendations is this – Do you want simple recommendation or do you want the real one ? This is a simple one and it produces recommendation which is better than default but might not be optimal one. Typically you will see performance improvements from increasing log files to be based on the law of diminishing returns with first increases giving you good performance boost and when later much less so. The actual gains depend a lot of workload – updates hitting same database pages over and over tends to allow to eliminate writes with large log files helping a lot as well as IO performance – slow storage will find additional IO caused by smaller logs more taxing. Also for most workloads you will have some sort of natural maximum log space which will be used – based on innodb_io_capacity and other factors – increasing logs beyond this value will not produce any gains. I think the good way to set the optimal log files is to look at the Checkpoint Flushing IO as Vadim shows – while increasing log files allows you to substantially reduce such IO it is good to do so… keeping crash recovery times in mind. Has that changed with 5.5 dramatically?